As the digital world advances, online searches have become the day-to-day norm. With so many searches being completed every day, search engines like Google, Bing, and Yahoo needed an easier way for their bots to index website information for SERP displays. These three platforms collaborated and created schema.org. This coding format presents your website’s information in an easy-to-decipher script that is quickly indexed by search engines. What Does Schema Markup Mean for Roofers? Correct Schema Helps Google Index Your Information for Better Ranking and SERP Results. Microdata tags used for markup are agreed upon by the SEO community. As the Mr. Roof company displays here, schema markup can give you a leg up against the competition by providing detailed SERP results that are more likely to generate traffic. The schema project aims to form a better relationship between websites and search engines with the common goal of improving user search results by delivering higher-quality options with more relevance. 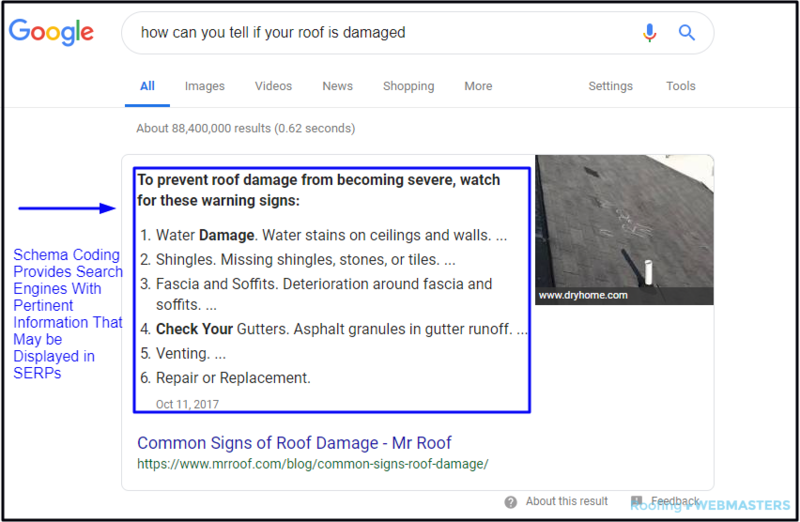 Call (800) 353-5758 to learn more about schema markup services for roofers and how this coding technique can help your roofing website rank better in SERPs. How Can Schema Help my Roofing Company? Search engines have come a long way in recent years. While Google and others, like Yahoo and Bing, once relied almost exclusively on verbatim keywords, they now account for context and user intent. This evolution has made the search engine a more user-friendly tool, as it helps searchers find the information they are looking for more efficiently. Of course, it takes compliance from websites and their willingness to implement schema markup into their HTML code, but with the benefits the concept introduces, there’s no reason not to comply. Roofing Webmasters is eager to help you get started today. Do Roofing Websites Need Schema? Although a website can definitely survive without data markup, it cannot realize its full potential. The goal of roofing websites is to generate leads, and microdata tags from schema.org work towards that objective. To do this, your site’s schema coding creates an easy-to-read layout for search engines that displays pertinent information or details. The Roofing Webmasters team is ready to help you get better results in SERPs by adding properly coded schema markup to all components of your site, including headers, body content, footers, and even meta descriptions. Schema markup is a top SEO tactic because it directly communicates with search engines. As a technique so closely related to the search engine itself, there’s really no other category to place it in, if not search engine optimization. Marking up data is an optimization practice, as its use is to organize content and effectively communicate it to Google and its users. To get started with schema markup for your company website, call Roofing Webmasters today at (800) 353-5758. Updated on March 14, 2019 at 8:43 pm by Roofing Webmasters.